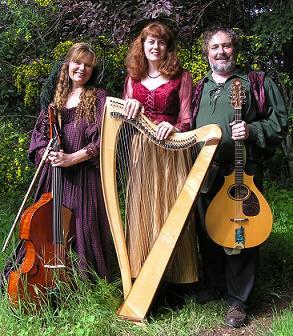 Brocelïande (Margaret Davis, Kristoph Klover, and Kris Yenney) will return to Caltech with music from the British Isles, Medieval and Renaissance music, and original settings of the songs of J.R.R. Tolkien. Featuring stellar vocal and instrumental harmonies, their enchanting sound is built on the interweaving of 3-part vocals with Celtic harp, guitar, cello, octave mandolin, recorders, Swedish nyckelharpa, flute, and more. Kris plays the only “Hardanger cello d’Amore” in existence. Brocelïande has performed throughout the West Coast since 1999, at festivals, concert series, and a cameo in the movie “Bedtime Stories”. Their delight is, through evocative and sometimes obscure historical means, to uplift the audience and provide a sonic sanctuary for all. They specialize in seasonal fare and the music of J.R.R. Tolkien, honoring the elements of Nature and celebrating the human experience. They have recorded 7 CDs, most recently “Make We Merry,” their second Winter album. Rambles Cultural Arts Magazine says of them “These people are good. Each is a master of the various instruments they play, and their arrangements are intricate, exciting, exceptional music … their vocal harmonies are exquisite.” You won’t want to miss this all-too-rare Southern California appearance by Brocelïande. Tickets are $20 for adults and $5 for children. They will go on sale soon and can be purchased by calling the Caltech Ticket Office at (626) 395-4652. Online ticket sales will also be possible and they can be bought at the door on the night of the show.